Important new JNCC publication on UK mammals, summarising results from the Tracking Mammals Partnership, a collaborative initiative, involving 24 organisations (including the relevant NGOs) with a variety of interests in mammals. The aim of this report is to improve the quality, quantity and dissemination of information on the status of species in the UK. The report comprises 5 chapters and 4 appendices. Chapter one provides an introduction to the work of the TMP and some historical background. Chapter two provides a detailed overview of the TMP Surveillance and Monitoring Programme including information on all the schemes currently running or planned in the near future. Chapter three provides detailed information on the work of the volunteers and the support provided to volunteers by the organisations in the TMP. Chapter four provides accounts of individual species including information on distribution and population change that is available from the various schemes in the TMP. Chapter five provides a synthesis of current knowledge on mammal populations and considers the future for mammal surveillance and monitoring, including the potential funding implications of providing a comprehensive network. A list of the organisations in the TMP appears in Appendix I with a short summary from each organisation on their involvement in the Partnership. 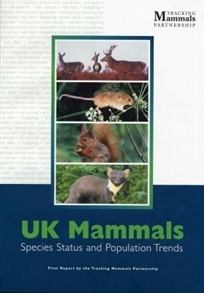 Appendix II contains information on legislation and conservation initiatives pertaining to mammals in the UK and internationally. Appendix III provides a glossary of terms used in the report and Appendix IV a list of acronyms.